You know I am truly blessed. A lot of fine things have been laid upon my table. This week is no exception. God really does love me! Remember a few posts back, I canned some bread and butter pickles? Well pull up a chair, because this story might take a while. So, my husband brought a few cans of bread and butter pickles into work. Where a coworker commented that his mom used to make bread and butter pickles. My husband came home and told me this story, so we had to let him have a can or two to compare to his mama’s. I certainly wouldn’t want to out do his mama, but I do hope he enjoys them. He comments to my husband the next day, “Do you like crabs?” Do you want some crabs?” My husband comes home and asks me the same question. “Well, does a bear poop in the woods?” I ask. Of course I love crabs. The next day he comes home from work and asks, “Rich wants to know if you want them live or steamed?” “What live or steamed?” I ask still not sure if it is true. “The crabs I have been telling you about,” my husband answers back. “Rich wants to know, do you want them live or steamed?” “Well Live I guess,” I reply, but if they are steamed, I will understand. It is much easier to transport that way. Well the next evening my husband comes home with crabs! A whole big cooler full of luscious beautiful crabs.There were jimmies as far as the eye could see! There were at least a dozen of them. I couldn’t believe my luck! I hadn’t had jimmies in years. Now, I have had the Alaskan Crab legs at local seafood restaurants, but these are not the same. I went in the house and got my big stock pot and added water and got it going. I added a few things to the pot to add some flavor. I will give you the full recipe at the bottom of this page. We had quite a few lively ones at the top of the cooler, upon closer inspection, I realize that a few were not moving. 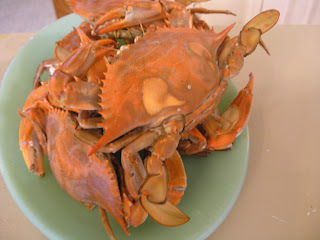 We lost a few, my husband did not know that once crabs die you cant eat them. They had been sitting in his car in a cooler all day. This crab thing is all new to him. Next time, he promised to call me to get them if he cant make it home. 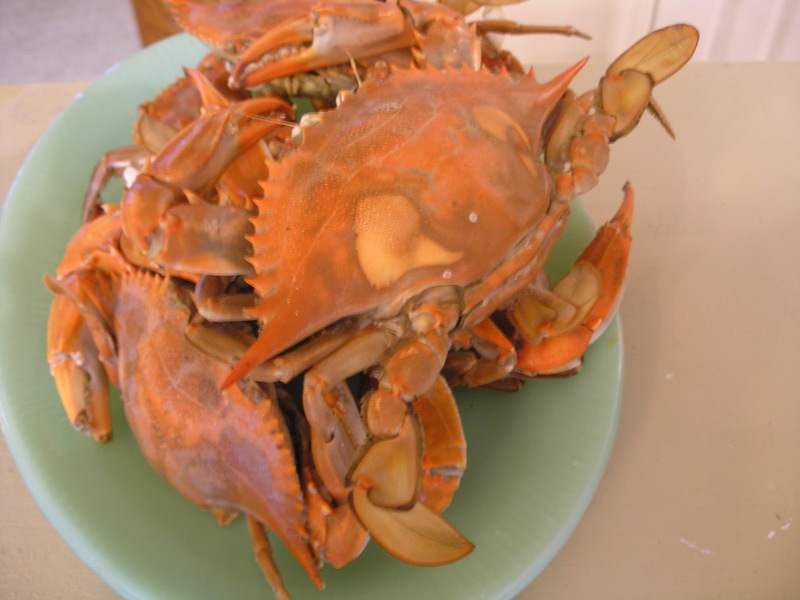 So, the ones that survived, I steamed with some Old Bay and ate them with some drawn butter. They were so sweet and good I couldn’t believe it. They were pulled from the Lynnhaven River that very morning. Could you imagine getting crabs out of your own back yard when ever you wanted? Now that is a true blessing. I have come to the conclusion, I got the better end of this bartering deal. Oh, and by the way, Rich, you can have bread and butter pickles any time. Combine liquid ingredients with seasonings. In a large stockpot with a lid, place the liquid in the pot. Bring to a boil and add the crab. Cook until the crab is bright red.